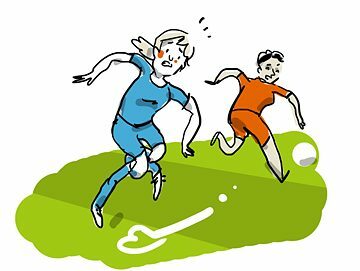 Anyone wanting to chat about football in German needs to have a few useful idioms down pat – and to be able to use metaphors. 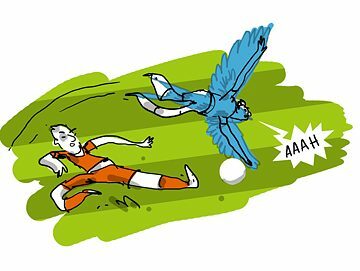 We have put together a list of some of the most figurative German football expressions on Goethe.de – and taken them quite literally. Someone who keeps the ball low is keen to minimize risks – both on the football pitch and in life. If we keep the ball low, we want to be able to see what is going on and proceed with care. This is the way this football expression has found its way into everyday parlance, as low and short passes are much more likely to reach their target. Franz Beckenbauer, known as “Kaiser” (i.e. Emperor) Franz, believed that the formula for success was to “play low and win high!”. 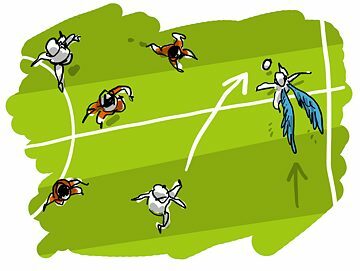 Originally, this German idiom – which literally means “making a swallow” – came about because a player who dives with arms stretched forward and legs slightly akimbo looks a bit like the silhouette of a swallow. Nowadays the expression is used for any intentional stumble or fall: if a player wants to pretend that they have been fouled by their opponent, they make “a swallow” and throw themselves dramatically to the ground. 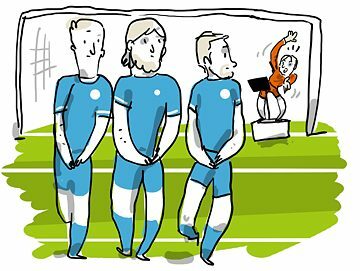 If the referee sees through the deception, the player will get a yellow card – if not, a free kick or even a penalty will be awarded. Normally, the term “Rudel” refers to a small group of mammals – a pack. 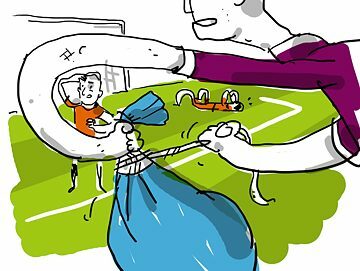 Packs can also form in football, however – normally following bad fouls or controversial referee decisions. In a state of considerable agitation, players crowd around the ref or opponent to vent their anger and discuss the situation loudly and animatedly. Things can often get pretty aggressive – something the referee doesn’t like to see at all. 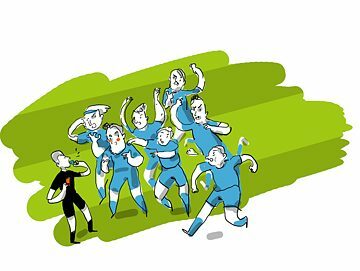 Forming a pack is against the rules and can result in a yellow or even red card being given. Before a direct free kick, and sometimes even before an indirect one, players in the defending team stand next to one another in front of the goal to deflect the ball – forming a “wall”. The goalkeeper yells out instructions to make sure that the wall protects his zone as best as possible: “a bit to the right”, then “a bit more to the left” – this is precision work. As he also tends to gesticulate wildly during the process, the Germans say that he is “conducting the wall”. Some players are so skilful that the opponent simply has no chance of getting at the ball, as it is flicked left to right and back again at breath-taking speed. When a player is this good at dribbling, and is additionally able to throw their opponent by feigning body movements, they are said to “put a knot in their opponent’s legs”. Argentina‘s Lionel Messi is particularly adept at this, leaving one player after another standing in his wake. 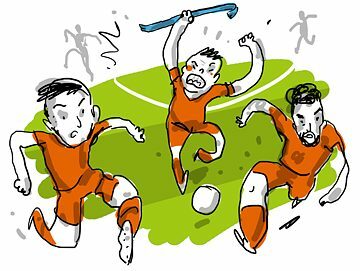 This idiom is bound to be heard during every match, especially if no goal has yet been scored or if a team is trailing. The experts on the terraces generally believe that this is because the players keep trying to get the ball through the middle rather than using the entire width of the pitch. 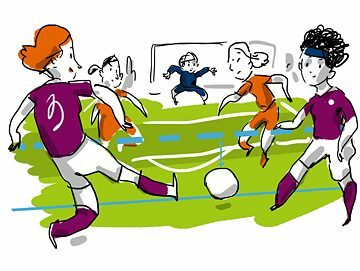 “They should play down the wings”, urge the spectators – and in fact it is better to remember the players who are waiting on the sidelines, on the “wings” of the pitch. While pushing towards the goal via the wings is no guarantee of success, it often gives rise to additional opportunities and makes a match more interesting. This expression is used when a team is playing so defensively that the attacking team has hardly any chance of breaking through. In this scenario, almost all the players will be defending their own penalty area. This tactic is not popular with fans, as it impedes the game flow. It is normally used when a team is marginally ahead and wants to do everything it can to prevent the opponent scoring again. “Now they are really mixing concrete”, the spectators can be heard muttering on the stands. If faced with a team that is mixing concrete, the best option is to “play down the wings”. A crowbar is a simple tool for breaking open or raising something. A person who uses a “crowbar” to get their way pursues their goal with a total disregard for the consequences. 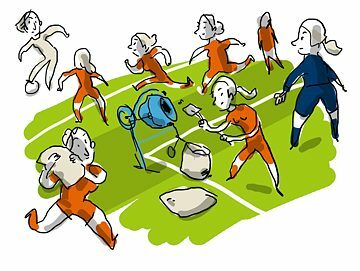 This metaphor is often used in football when a team goes all out to score another goal. In some knockout matches even the goalie can be seen running towards the opposing penalty area. “Now they are getting out the crowbar”, is what this is called by the fans, who often rather like this approach – despite it generally being at the expense of tactics and elegance. Closing the bag means bringing something to a successful conclusion – and not giving away a victory that had been thought certain. This idiom is frequently used in football when a team that has been leading ends up losing after all. In this case the fans and football reporters like to review all the opportunities their team allegedly had and which they believe should definitely have resulted in further goals. It is a moot point whether these opportunities were really so favourable. But in the opinion of the fans, there can be no doubt: “They should have closed the bag” – with or without a crowbar. 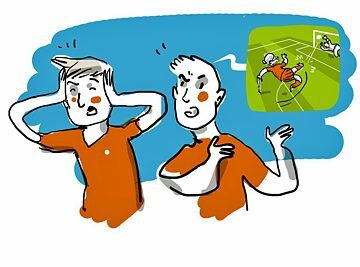 Ula Brunner, an editor and journalist in Berlin, provides some background insights into the world of football jargon.